At over 10 miles long, Windermere is the largest lake in both the Lake District and England. It is fed by the rivers Brathay and Rothay at its northern end and outflows into the River Leven at the south. Its name derives from the Old Norse name Vinandr and mere, the Old English word for lake. It is therefore incorrect to refer to it as Lake Windermere. The major settlements around the lake are Ambleside, Bowness, and the town of Windermere. Only Bowness is on the shore. 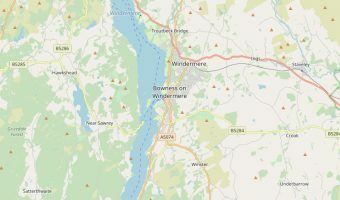 Windermere town lies ½ mile inland from the lake and Ambleside is accessed via Waterhead. The lake contains 18 islands. Belle Isle is by far the biggest and can be seen from Bowness. It’s also the only inhabited island on the lake but is privately owned and not accessible to the general public. Passengers on passing boats may be able to catch a glimpse of the unique Georgian roundhouse through the trees. The eastern side of the lake is developed and is packed with tourists in the summer months. Most of the lakeside mansions here, originally built for Victorian industrialists, are now hotels. Attractions on this side of the lake include the Lake District Visitor Centre at Brockhole, the Windermere Steamboat Museum, Blackwell, and Fell Foot Park. The A591 and A592 run alongside the lake, linking Ambleside to Bowness and Bowness to Newby Bridge. Visitors can escape the crowds by taking the Windermere Ferry to Ferry House on the western side. There are no roads, towns, or villages here and a path runs along most of the shoreline. Most of the area is owned by the National Trust. Lakeside is a small harbour at the southern end of western shore and is home to the Lakes Aquarium and the Lakeside and Haverthwaite Railway. In the summer a minibus service runs from Ferry House to Hawkshead with a stop at Beatrix Potter’s Hilltop House. From Hawkshead onward connections are available to Coniston Water and Grizedale Forest. Windermere Lake Cruises is the only company offering boat trips around the lake. Services run all year between Bowness, Ambleside (Waterhead), and Lakeside. Cruises around the islands and ferry service from Lakeside to Fell Foot Park operate in the summer. In 2005 a 10 mph speed limit was introduced on the lake (6 mph in certain areas), effectively halting power-boating and water-skiing. All powered craft using the lake must be registered with the Lake District National Park Authority. This can be done at the Lake Wardens Office at Ferry Nab. Boats must be launched and landed at recognised sites. Small boats, kayaks, rowing boats and other craft can be hired at various places around the lake such as Fell Foot Park, Low Wood Watersports and Activity Centre, and Waterhead and Bowness (Windermere Lake Cruises). Fish in Windermere include char, trout, pike, perch, roach and eels. In autumn sea trout and salmon migrate through the lake. Anglers must have a valid Environment Agency Rod Licence. They can be purchased from post offices or online from the Environment Agency website.